These are a couple of really simple Saraswati Mantras for student. These mantras have been recommended by me because they are small and easy to recite and do not involve any complicated procedures. The meaning of these mantras is equally simple – I pray to the Goddess who is knowledge. This helps students understand that knowledge is divine; knowledge has to be respected and that knowledge is God. The Gayatri is probably one of the most chanted and most scared of the Hindu Mantras. This is the mantra for illumination of the mind and to take one to the right path. 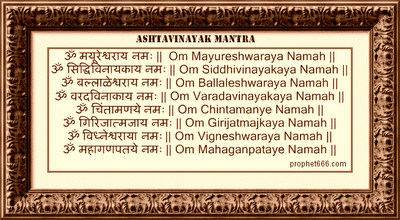 Most of the Hindu deities have their own individual Gayatri Mantras attributed to them. A lot of people who don’t have sufficient time at their disposal are confused as to which mantra they should recite; the Gayatri Mantra or the Gayatri Mantras for their favored deities. In the past I have given some mantras to remove fear of snakes and also for protection from snakes. The mantra which I am giving here is one which makes a snake come out from its hole or hiding place and go away. This is an ancient Indian Shabar Protection mantra to protect oneself and deflect all kinds of black magic experiments conducted by your enemy to harm you. This mantra is an invocation to Hanuman for protection against black magic by the enemy. This is a Shabar Mantra for enemies. This Mantra is known as the Shatru Mukh Stambhan Mantra meaning Mantra to silence enemies. This Mantra is suitable when you are certain that your enemies might try to harm you by defaming you or that they might have discovered your secrets; by which they might harm you. Also useful in court proceedings where the enemy is likely to give damaging evidence against you. This is a Tantrik Yakshini Mantra Sadhana. This Sadhana is done to win the favor of the Pramoda Yakshini. This Yakshini is said to be a feminine energy which is said to show the location of hidden wealth. The Pramoda Yakshini Mantra given below has to be chanted 1000 times after midnight after having a bath and wearing clean clothes. Today is Akshaya Tritiya; one of the most auspicious days in the Hindu calendar. Best wishes to all the readers of this site on this most auspicious occasion. This day comes every year on the third Tithi [third day] of the Shukla Paksha [waxing moon] in the Hindu month of Vaishakha. Normally Indians purchase gold, jewellery and other household and luxury items on this day. This Nostradamus Quatrain appears to be descriptive of a typical hostage crisis. However this has to be huge event as it has been found worthwhile by Nostradamus to have included it in his prophecies. This Quatrain appears in Century 10 which has some of the most disturbing prophecies; yet to be fulfilled. Some of these have already been interpreted by me as concerning the much awaited World War 3. Hair fall can be triggered off due to a variety of reasons; most common amongst these are genetic, emotional, impurities of the blood and stomach. No clear cut remedy exists to arrest hair fall and activate regrowth of the hair. However some traditional remedies claim to stop hair fall and enhance regrowth. Sheetla Mata is the Indian Goddess who is worshipped to get cured of small pox, chicken pox, measles, severe infections of the skin and blood and diseases related to excess heat in the body. This mantra given in this post is a mantra recited to seek the favor of Sheelta Mata in curing the diseases which I have mentioned above. This mantra has to be chanted 108 times in any Shakti temple; if a temple of Sheetla Mata is located in your town; nothing like it. This is a mantra for stress and tension relief. This mantra is comprised of unique Beej Aksharas which are a combination of sound frequencies combined for a specific purpose or goal. This mantra is beneficial in giving relief from stress and tensions which can if they start accumulating lead to serious physical and psychological disorders. This is a Mantra for diseases and ailments related to the stomach. This is a rare Shabar Health mantra which is dedicated to Hanuman; an important deity in the science of Shabar Vidya. This is a Shabar health mantra which is dedicated to Hanuman. This is another mantra to remove migraine. You can also check the other two mantras given before in the section on Health Mantras. The Siddhi is acquired by chanting the mantra 108 times and taking some Bhasma [ash from the sacred fire]. This Bhasma has to be kept aside in an envelope for you to use it whenever required. These are some most simple paranormal Indian remedies which are said to remove obstacles and hindrances coming in the way of marriage. 1] On any Thursday mix a few Kesar [Saffron] sticks in the bucket of water with which you are going to have your bath. In Hindu philosophy “thoughts are thing” thoughts have an existence of their own. Thoughts generated in the mind of someone don’t reside their permanently; once aired they become the property of the overself, thus everyone; every being is connected to the overself. This is a paranormal Indian remedy which is used for success in winning court cases and litigation. The remedy makes the use of a simple mantra. The remedy is quite simple to practice and does not require much effort or time. Before the due date when you have to appear in court for the arguments, evidence or any other court proceedings all you have to do is to think of the opposing party; bring his image in your mind and repeat and dedicate the simple mantras given below 108 times to the opposite party. This is a Vishnu mantra for anger control. This mantra is suitable for those who are unable to control their anger. Such people get angry at the slightest pretext and indulge in unreasonable actions which they later on regret. This is a Ganesh mantra for all problems in life. This mantra dedicated to Ganesha or Ganpati as the Siddhivinayaka [the bestower of mastery or the fulfiller of wishes]. Like all Ganesh mantras this one is also a Satvik [pure] mantra and will not works for wrongful or harmful purposes. The Ashtavinayak or the eight Ganesha or Ganpati temples are located in small towns near the city of Pune in Maharashtra. The Ashtavinayak Yatra or the pilgrimage to all the eight Ganesha temples is normally completed in 2 days if you commence the Yatra from Pune. The Sacred fig tree, Peepal in Hindi has its own unique place in Indian culture and religious beliefs. This tree is known as the “king of tree” in the Hindu religion. The Buddha gained Nirvana while meditating under this tree. Fights quarrels and domestic disputes of all kinds between husband and wife are amongst the most common problems faced by people all over the world. I get a lot of mail regarding solutions for this problem, however due to time constraints I find it very difficult to reply to most. The Mantra given in this post is similar to the one given above. This Mantra goes a step ahead and the Mediation in for ultimate bliss or the state of Non – Duality. This is a Shiva Mantra which is chanted with devotion by those who have renounced worldly life. The meaning of this Panchakshari [5 letter] Shiva Mantra is – The Shiva who helps us survive the Ocean of existence. This is a Recommended Daily Mantra to begin your day with. This is a Shabar Mantra composed in the commonly spoken script of the India of the middle ages. This Mantra is said to ensure that the day passes smoothly, happily and peacefully without any obstacles. This is another one of the magnificent Indian mantra to attract the Goddess of wealth Laxmi. This Mantra is to improve finance and fix the finances. Many persons have experienced the fruits of this Laxmi Mantra. This is a Mantra to avoid falling asleep. This Mantra is especially for those who for some particular reason wish to avoid falling asleep. This is one more rare Mantra for specific purposes from the ancient Indian scriptures. This is another one of the powerful and rare Indian Mantras to remove Ghosts from the being of a possessed person. These Exorcism Mantras were and still practiced by practitioners of Tantra in India. This particular Mantra to remove Ghosts has to be recited 108 times holding a cup containing some water in your hand; this binds the water with the Mantra. The air is full of a possible attempted military coup in India. The news centering around small scale military maneuvers around the 16th January 2012 is gaining unprecedented attention. Rumors are flying around; one does not know the real truth. But first of all this is a spiritual site all interpretations of the prophecies of Nostradamus and other prophecies done by this site are based upon our own scientific studies. We are not influenced by rumors or colored opinions. This is a deeply spiritual and devotional Mantra of Shiva. This Mantra is often referred to as a Gayatri Mantra; a Mantra for the illumination of the mind and to come close to Shiva. The Mantra is most suitable to those who meditate on Shiva as the infinite being and those aspiring for spiritual growth and enlightenment. This is a Shabar Karya Siddhi Mantra of Hanuman. The Siddhi of this Mantra is acquired on any Saturday after sunset by reciting this Mantra 1100 times. This has to be done sitting before an image of Hanuman or in a Hanuman temple. Then you only have to recite the Mantra 3 times before the commencement any important work to ensure success in that work. There are two Mantras which I am giving today; both of them address one of the most pressing problems faced by most families today; that of differences between the husband and wife. Both the Mantras given in this post are most powerful Mantras to remove husband wife differences. Both these Mantras I have been told are said to work wonders in resolving husband wife differences and usher in domestic harmony. This is another Mantra which is used to relieve eye pain. This Kshertapala mentioned in this Mantra is Bhairav; hence the Mantra is dedicated to Bhairav. The procedure is quite simple when eye pain is experienced chant this Mantra 21 times and sprinkle some water on your eyes. This will relieve the eye pain. The Kaal Sarp Yog or the locking of other 7 planets in between Rahu and Ketu assumes great significance in traditional Indian astrology. I had in earlier post given Mantras as well as remedies which are prescribed in India for those who have this particular planetary configuration in their Birth Charts. This is a Shabar Mantra dedicated to Guru Dattatreya which is specially prescribed to students. This Mantra relieves the stress and tension which is felt before an examination. The Mantra also enhances memory power and increases intelligence. 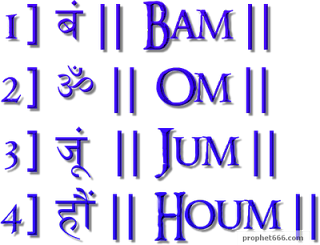 These are 4 different Ek Akshari or 1 letter Mantras of Shiva. These are the Beej Mantras of Shiva. All these Beej Mantras are salutations to Shiva. However you must remember that Beej Mantras have no meaning attached to them. You will notice that I have given Om as also being one of the Beej Mantras, Om has over a 100 different meanings attributed to it; this is one of those. Health is and should be the first priority; hence the numerous health Mantra which appear on this site. In this post is contained a very small and simple Mantra which is most effective while taking medicines. This is a Vedic Cure of fever through the use of a specific Gayatri Mantra. Such paranormal remedies were widespread in the Vedic times and they are still practiced in some parts of India. Mixed in a cup of Milk.